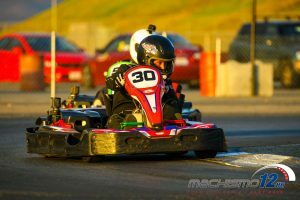 The Pro Class would see teams fielded by both kart owners and a trio of local So-Cal teams, as 2Wild Karting, Josh Huff Motorsports, and Troy Adams Coaching partnered up with the annual endurance event. In Friday’s ‘Under the Lights’ Qualifying, it was one of the privateer teams claiming the top spot, as T4 Autosport’s Taylor Hays put their #54 on pole to lead the field in the Le Mans style start. 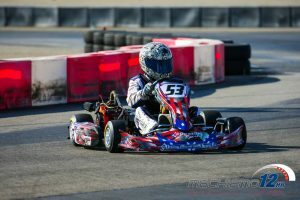 Turn 1 would belong to Destiny Racing’s KC Cook, however, taking the #53 to the front, and eventually a 45+ second lead before the first driver changes began about two hours in. 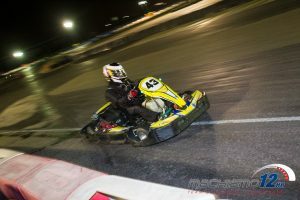 The de-facto team to beat nearly all race, Destiny Racing would close in on the final hour with nearly a seven-lap lead; but then their exhaust began to get louder and louder. Brought in by the officials to address the issue, the team simultaneously broke a throttle cable as they entered the mechanical area. After nearly 11 hours without issue, the team feverishly attacked both the issues at hand, as well as finished their final required tire change. Unfortunately, the 10 minutes to do so would see their lead evaporate, and then some, losing the top spot in the pits, and eventually settling for second overall. This opened the door for team HRT/S Squared, who had battled and overcome brake issues throughout the race, to be in the right position to inherit the lead with an hour remaining. 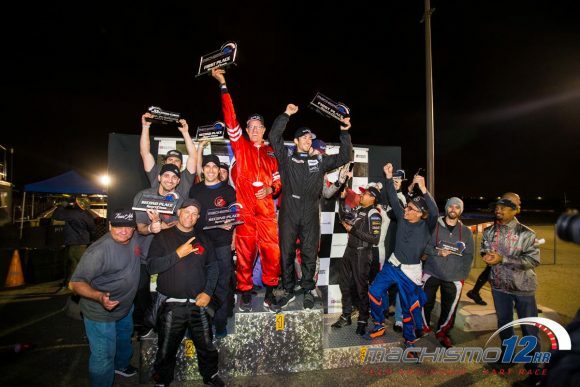 With multi-time Machismo winner Logan Calvin at the helm, the team held on to score the 2018 Pro Class victory by one lap over team Destiny Racing. 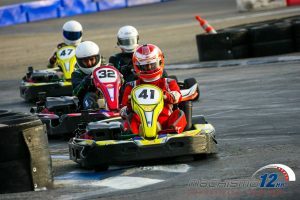 For their part, team 2Wild Karting surpassed all via their speed under the mechanical tent, and while they too incurred an issue in the late stages of the race, were able to get back on track to secure a well deserved 3rd place overall and in class. 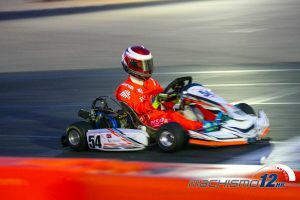 It would all start with team Keep Pushing 303 locking up the pole position for the class with Lukas Dziemidok behind the wheel, earning the spot just behind the Pro Class karts for the Le Mans style start. When the race did finally get off, they would lead the class unchallenged for the opening 25+ minutes before coming down pit lane for the first of their 17 required driver stints. This would see team T4 Stone Cold inherit the top spot, with team Mahkra in tow; a pair of teams with two starkly different futures in the race. T4 Stone Cold would show to be one of the contenders from the get-go, but just after the two-hour mark would get collected in an incident out of the Sunset hairpin, breaking a tie rod that saw them go down 12 laps for repairs. On the other hand, team Mahkra would inherit the mantle as the team to beat, going on to lead much of the race, both on track and on the stint chart. 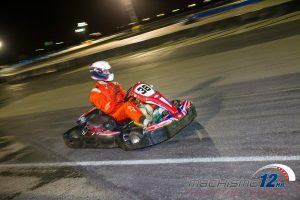 Mahkra continued to carry the torch as the race wore on, occasionally swapping the lead with team The Masters Champs with differing pit strategies, but always maintaining a front-running position. As the race neared the final hour, however, things started to stabilize, and it became obvious it was going to be a two-horse race for the win. 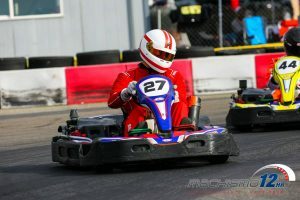 With about fifty minutes to play, The Masters Champs had made their final stop with driver Andres Prieto, and aimed to reel in Jerott King of team Mahkra, who had already finished their stops. The gap: about 20 Seconds. With 30 minutes remaining it was down to ten seconds; then four seconds with just ten minutes remaining. 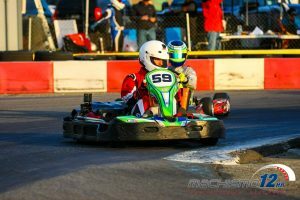 Needing to working traffic quickly yet efficiently, Prieto slowly worked his way closer and closer to his goal, and on the white flag lap he was just a few kart lengths astern. With a last-lap lunge in the Center Hairpin the move was made, and with King sliding through the marbles on the outside of the corner, the lead was secured. After 12 hours of racing, team The Masters Champs would win the 2018 Super Sport Class via a last lap pass, with team Mahkra settling for second after an impressive run at the front all day. Pole sitters from the day before, team Keep Pushing 303 would emerge as the third place squad, finishing two laps back after also being a contender most of the day. 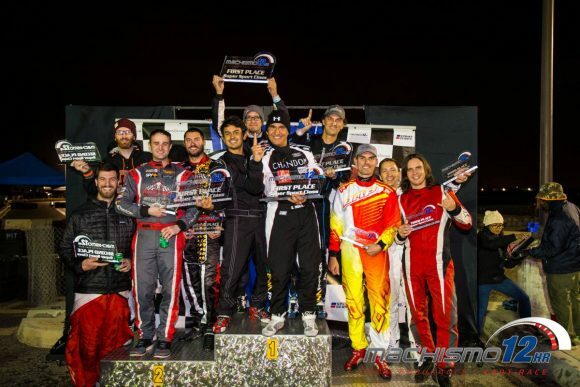 The entry-level category for the Machismo 12 Hour, the Sport Class sees a mix of less experienced albeit still very quick drivers enter the event, and many times some of the most unexpected results ensue. 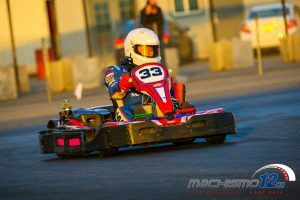 They also see some of the lighter drivers mix things up with the Super Sport category, which is exactly what we saw in Friday’s qualifying session, as team Moon Bear Racing’s Seth Willits snagged the pole -and 2nd overall for the sport karts- by just .075 seconds. 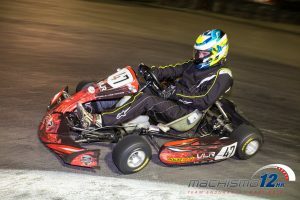 When the green flag flew on the event Saturday, it was actually Moon Bear Racing that would lead all other sport karts across the line, eventually settling in with the front running S1 drivers. The Sport Class would see a handful of teams control the sharp end throughout the event, with Moon Bear being joined by team Heel & Toe Watch Company, team Red Mist Activated, Dark Horse Sport, and FTR Platinum in the top five all race long. Of the five, however, two teams would emerge as the ones to beat, as Red Mist Activated and Heel & Toe managed to eek out a lead on the rest, both via speed and strategy. In fact, as the race neared the final hour, it was Red Mist who had taken over the lead from Heel Toe and looked to have the advantage, only to have disaster strike. After pounding the curbs over the previous 11 or so hours, the right front spindle would break on their machine, forcing them in for repairs for the crash damage. 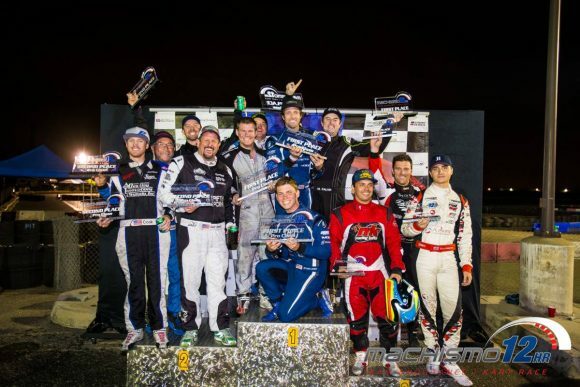 This gave the lead to Heel & Toe without challenge, and they would go on to score the 2018 Sport Class victory by over three laps.